Found 17 file extension associations related to Microsoft Publisher and 9 file formats developed specifically for use with Microsoft Publisher. With Publisher , you can easily communicate your message in a variety of publication types, saving you time and money. Whether you are creating brochures, newsletters, postcards, greeting cards, or e-mail newsletters, you can deliver high-quality results without having graphic design experience. Get the job done right the first time with Publisher. Import all your pictures to a single canvas in Publisher, and swap them in and out of your design with a simple drag and drop. Experiment to find the right image, without wasting time. Use professional-looking effects for text, shapes and pictures, including softer shadows, reflections, and OpenType features such as ligatures and stylistic alternates, that are familiar to use because they work like the effects in other Office applications that support them. Use Publisher to search your online albums on Facebook, Flickr and other services and add pictures directly to the document, without having to save them first to your desktop, laptop, or slate. Use your photos as high resolution page backgrounds, and make your publications look professional and polished. Include photos and links in the familiar mail merge tools, and boost the personalization of your newsletters, cards, and emails. All your personalization needs in one place in the ribbon. Simplified sharing – Your documents are saved to the cloud by default. * You can share and collaborate just by sending a link. It’s now even easier to print your great-looking publications or photo albums at any print shop with the ability to save all of your pages to a common picture format, such as JPG. Share a page as an email or send the entire publication in the email message (as HTML) – all the pages will be combined to one message for you. 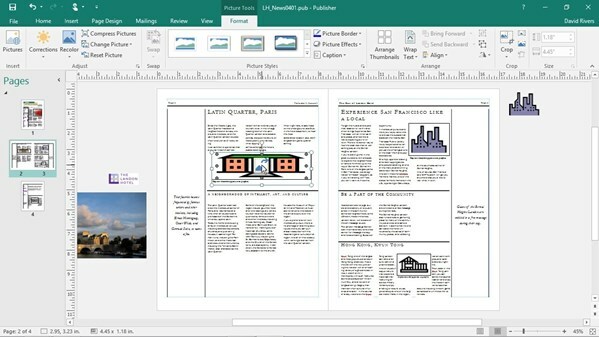 If you need more information please contact the developers of Microsoft Publisher (Microsoft Corporation), or check out their product website.